I am excited about introducing you to Mamaearth Aloe Vera & Coconut Based Foaming Face Wash for Kids. It is an everyday foaming face wash for kids which is a tear-free and soap-free formula cleanses and moisturizes your baby’s face gently. Like other products, the natural ingredients of this face wash are always FREE of Parabens, Phthalates, SLS, detergents, or artificial fragrances. The Facewash infused with Coconut based cleansers, Calendula extract, Aloe vera and Lavender oil. The Foaming Face Wash is very gentle and totally safe on kids skin. Let's move on to the details. 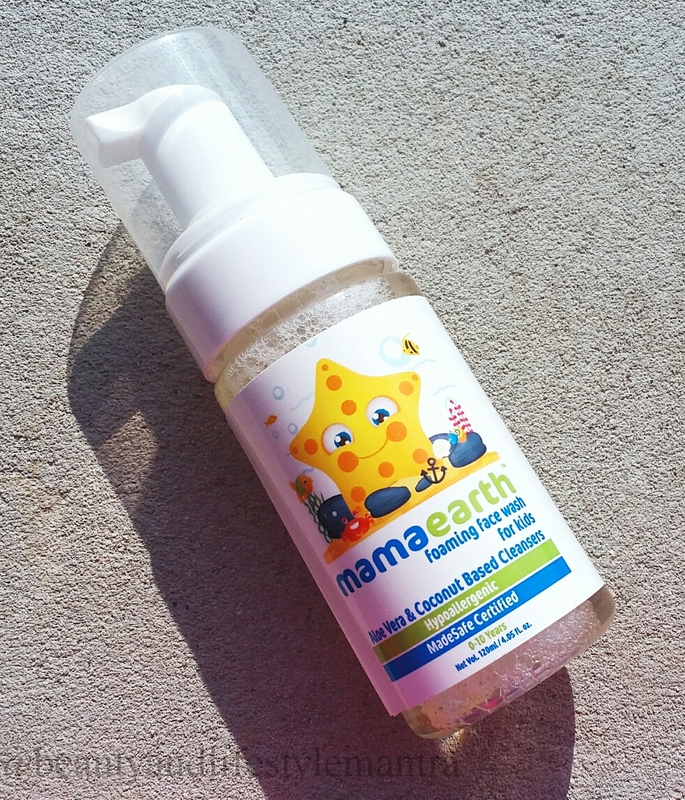 Mamaearth’s everyday foaming face wash for kids is made safe certified, dermatologically tested and pH balanced. It has a tear-free and soap-free formula which cleanses and moisturizes your baby’s face gently. Infused with Coconut based cleansers, Calendula extract, Aloe vera and Lavender oil, so it nourishes while cleansing your babies skin. Foaming Face Wash is hypoallergenic with no harsh chemicals like SLS, parabens, phthalates, detergents, or artificial fragrances. Purified water, coconut oil, Sodium PCA, Decyl Glucoside, Vegetable Glycerine, Potassium sorbate, Lavender Oil, Calendula extract, Aloe Vera extract. Wet baby’s face with water. Let your baby have fun with the foam by applying it to their skin themselves. Gently massage the lather in a circular motion. Rinse thoroughly and pat dry. I love that the Mama Earth baby products have been made with gentle and natural ingredients designed to help nourish and care for the sensitive baby skin. Their products contain natural ingredients and 100% natural fragrances and have been made without phthalates, parabens, petrolatum, or SLS. 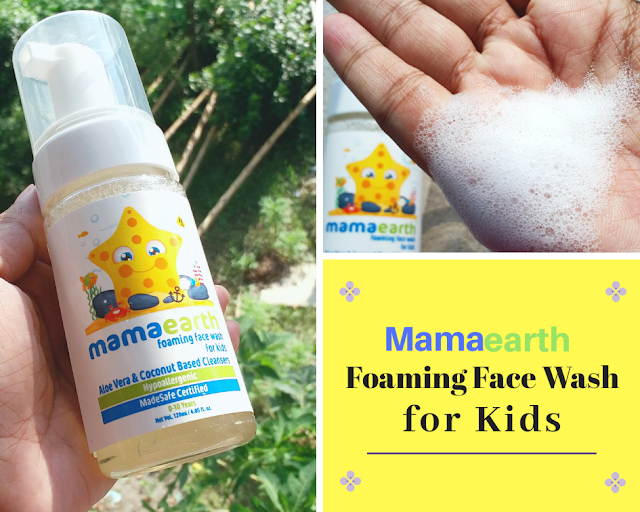 Mama Earth Foaming face wash is something unique and very effective product for kids. 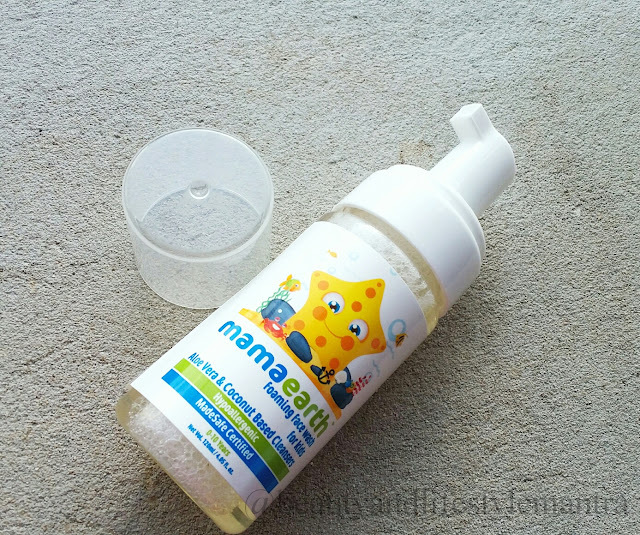 Mama Earth Aloe Vera & Coconut Based Foaming Face Wash has been designed to cleanse and moisturizes baby’s face gently. The Foaming Face Wash has been made with Coconut oil, Calendula extract, Aloe Vera and Lavender oil which works together to clean dirt and impurities and makes the baby feel refresh. My boy has very sensitive skin and little dry, it easily washes away impurities like dirt and grime without drying out his sensitive and delicate skin. After few uses, I could see and feel a difference in my little boy’s skin, simply softer and smoother, and with no irritations at all. We love this for bath time. It makes an everyday task more enjoyable and easy because I do not have to create a lather in my hands. It's designed in such a way that the foam is made with every single pump. We only need to use a little at a time to get lots of foams. It's super gentle on my son's skin as well. The skin feels very fresh and pleasantly fragrant after its usage. I use it as a body wash. I really love how it works on my baby's skin. The Bottom Line, This is a wonderful Aloe Vera & Coconut Based Foaming Face Wash for Kids. Like other mamaearth products, it smells so subtle and nice. All ingredients used are organic and natural. They are gentle, free of toxicity and irritants and are totally safe for baby’s sensitive skin. It didn’t cause allergies or reactions. You can definitely consider this facewash in your baby care product list. Definitely well worth its price. 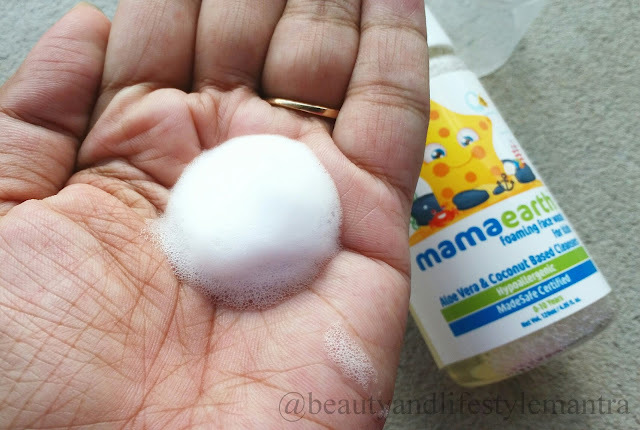 I highly recommend MamaEarth Aloe Vera & Coconut Based Foaming Face Wash for Kids to moms who are very fond of natural products. Disclosure: This post contains affiliate links. Purchasing using those links may generate a small commission, which will be used for the maintenance of this site.